The 'WADI' programme is basically an agriculture based farming system linked with processing and marketing of products, micro-finance initiatives, health components and women's empowerment through people's participation for income generation activities. The State Government has introduced WADI project on a pilot basis in Bandwan in Purulia district with joint venture with NABARD. 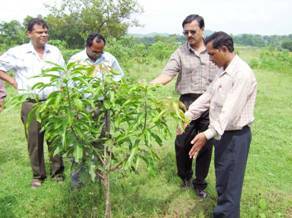 Mangoes and Cashew nuts are being cultivated in the project. The project cost for Bandwan is Rs. 386.68 Lakh respectively. Duration of both the projects is about 8 years starting from 2006-07. Another project has been introduced in Manbazar-II block during 2009-10.